The Only Flying Trapeze School in San Antonio - Come fly with us! For Kids and Adults!! Safety is our first priority! 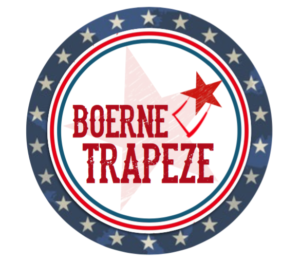 Boerne Trapeze offers the highest level of professional trapeze instruction and safety for your protection. A minimum of 2 fully trained staff operate the rig, for catching classes there are at least 3 trained staff members. You will be harnessed in safety lines from the time you leave the ground, until you return back to it. There is a safety net under you the entire time you are flying. We are there to assist you every step of the way. Though flying can be scary at first, the risks involved are mostly emotional. It is an extremely controlled environment, hurting people is bad for business. It’s important that you listen. The rules are for your safety. A few scrapes or bruises, as in any activity, sometimes occur. However, rest assured every precaution is taken to make sure that each participant enjoys a safe experience. This applies to flyers and non-flyers alike. They are for your safety and enjoyment. Never go under the net! Stay away from the person pulling safety lines. Don’t stand in the box where the belays land. Follow the directions of the Instructors. WHAT IS THE FLYING TRAPEZE EXPERIENCE LIKE? Climbing the Ladder - Your personal safety harness will get hooked into the belay to climb the ladder. At the top, you will step onto the platform where your ladder belay will get switched to the safety lines. Jumping from the Platform - Listo…Ready…HEP!!! You will then jump from the platform and fly through the air with the greatest of ease as you swing gracefully (we hope) on the flying trapeze. Your instructor will be holding your safety lines from the ground. They will be giving you simply worded instructions in a loud voice every step of the way till your feet are once again on the ground. Wear comfortable, non-restrictive clothes such as workout pants and tops. A t-shirt with sleeves to protect your shoulders is highly recommended. Please wear pants or tights that cover behind your knee, capri length or longer. Leave your jewelry at home or take it off before you fly, especially your rings. Long hair should be pulled back into a pony tail. Please bring soft soled dance shoes, water socks or sturdy socks that you don’t mind getting dirty to protect your feet on the net. Don’t forget your knee-high colorful socks or sparkly clothing if you want extra points! Liability Waiver - ALL participants must fill out and sign our liability waiver. If Participants are under 18, the Waiver must be signed by a parent or the legal guardian. Water and Fuel Food - Flying Trapeze is a sport and requires both effort and energy. Come prepared by eating something supportive of activity before you arrive, so you have the energy to do well. It is important to stay hydrated, especially in summer months, as it can be very hot. We offer beginner through advanced flying classes that are appropriate for adults and children 7 years of age and older. We recognize that everyone has the ability to participate in our activities, regardless of size, ability, previous experience, or strength. Our students range in age from 7-82! If you weigh close to 200lbs, you must be able to hold your weight from a low-bar for 20 seconds to ensure your safety on the high trapeze rig. No. Because of the timing involved with the flying trapeze, first time flyers can learn several basic tricks without much upper body strength. Of course, the more you practice, the stronger you will become. Flying trapeze is a great way to build strength and get into great shape! WHAT ARE THE PHYSICAL, HEALTH & MEDICAL RESTRICTIONS? If you are under the influence of drugs or alcohol, you will not be allowed to go on the trapeze. Save the celebratory drink for afterwards. If you have back, neck or shoulder injuries or have had surgery on these areas you should forgo trapeze. As with any exercise or physical activity you are advised to check with your doctor if you are uncertain about your capabilities. You will need to hold your weight hanging by the bar from your hands, and you will need to be able to climb the ladder to the platform. Please call to ask about specific concerns or accommodations. Vision and hearing impairments can be accommodated. People with other disabilities may be able to fly if they are able to climb the ladder with minimal assistance, and hang from the bar with their own hands. If you have questions, concerns or would like more information, don’t hesitate to ask. You must be at least 7 years of age or older due to our insurance requirements. With few exceptions, everyone’s first flying trapeze experience can be intimidating. But it is also more fun than you could possibly imagine! Being afraid of heights is normal and human. Most of our instructors were afraid of heights in the beginning of their flying career and continue to have a healthy respect for heights. (Ask Lisa or Jeanne about their experience with this! Even though they both were professional flyers, they both still battle fear every time they fly. And most days, they win!) It is empowering to take fear by the horns instead of letting it run you over. We have been in your shoes and will support you the whole time! CAN I GIVE IT A TRY WITHOUT PURCHASING A WHOLE CLASS? We’ll fit you in between classes if we can… For $15 you can go up and take a swing. (This price also includes “ground school” so you can learn to take off properly from the platform.) Call to schedule. HOW DO I RESERVE A SPACE IN CLASS? Classes can be purchased and reserved online. Due to the limited availability, classes are not reserved until they are paid for. If you have any trouble, questions or concerns please give us a call at 210-775-8106 or email us at boernetrapeze@gmail.com. IS CLASS EVER CANCELLED DUE TO WEATHER? A light misting rain, is no concern, but if a heavy rain comes through, you will receive an phone call or text message before class alerting you of the change in plans or, as a last resort, cancellation. We will then credit your account, so you can take the class at a later date. We are a small family business sharing our passion for flying. IF YOU HAVE SCHEDULED A CLASS, IT IS YOURS. We have a limited number of spaces in each class and frequently turn people away when the class fills up. If you give us ample notice (at least 72 hrs in advance) and we can fill your space, we will generally be nice and reschedule you. Classes ARE transferable, so you can always send a friend or family member in your place. The only exception is the Enrollment Term Classes. For those classes, you have to make them up yourself, though you will have 30 days to make up the missed class. CAN I FLY WITHOUT THE SAFETY HARNESS? Due to insurance requirements, every new student that comes to our school must fly ‘in lines’. If you are an advanced flyer, you you may fly without lines with the approved from our Lead Instructor. You must also show proof of health insurance and sign an additional Advanced Flyer Liability Release. *Eligibility is determined by our Lead Instructor. Absolutely! The more the merrier! Of course. Though, for everyone's safety, you need to make sure they are supervised while you fly. (Unless they are 7+ and in the class with you.) If you have someone in the class with you that is willing to help you supervise, we can separate your spaces in line so you can alternate while participating in class. We are a family-friendly environment. Often our kids will be there to play with and entertain your kids. Absolutely! You'll want evidence of your high flying adventure! We’ll even show you the best angles to shoot from. …And if you are really nice to us, we’ll even get the staff all together for a group shot. (Pyramid?) Don't forget to share your photos and videos on our Boerne Trapeze facebook page. WHEN CAN I SCHEDULE A PRIVATE EVENT? We do our best to accommodate the day and time that works best for your group. As long as we have the staff, we're on. We will also work with you in regard to details of your event.